What are Trace Fossils? Trace fossils include any impression or other preserved sign of activity (for example, feeding, scratching, burrowing, walking, or resting). Many animals, plants, protists, and bacteria have left their traces in the fossil record. These can be tubes, lines, scratches, or other features. They have various characteristics, such as types of symmetry or resemblance to traces made by modern organisms, that indicate they were most likely made by an organism. In some cases, such as dinosaur footprints or certain shrimp burrows, it may be possible to say what group of animal made a particular trace. However, unless a body fossil of the organism is preserved with the trace fossil, determining who made the trace is usually difficult. Because of this, trace fossils are described and given their own names, regardless of whether they match up with a particular organism. Trace fossils most often were created in soft sediments, and are usually preserved only if the sediment remains undisturbed until it has become rock. 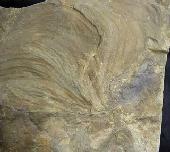 Trace fossils have been found in rocks as far back as the Late Precambrian. First known fossil occurrence: Precambrian.